All the light bulbs and lamps you use at home account for over 12% of your yearly electricity bills. That’s about 112 kilowatt-hour of electricity that goes to lighting your house. Doesn’t seem like a lot, does it? It is actually, if you consider the average 2019 electricity price of 13 Cents/kWh. That means you’ll pay almost $180 this year for lighting alone. Enter modern window treatments. The right coverings and attachments can help reduce the amount of energy you use to light up your home. That, plus beautify and make it more welcoming and comfortable. There are many types of window treatments, but we’ve listed the best 12 below. While they’re great for traditional houses, they also look awesome in contemporary homes. Sheers are window treatments made from fabrics like cotton, high-quality polyester, and silk. These are great in diffusing sunlight, which helps protect furniture from UV damage. With these window treatments, you can enjoy natural light while still maintaining privacy. You’ll find light-diffusing sheers in different colors, patterns, and fabric thickness. This also makes it easy to mix and match sheers, so you can achieve a more personalized look. For romantic, yet contemporary window treatments, go for sheer or silk balloon shades. These fabric shades add a touch of elegance to any room, especially those with modern themes. They got their name from how they billow and puff up when pulled open. Be careful when choosing fabrics though, as the wrong choice can make a room look outdated. Cafe curtains are “short” curtains wherein they cover only a part of the window. That can be the upper or lower half of the window. Although a traditional curtain style, the right fabrics and color give them a modern look. Fabrics in solid colors are good choices for a more contemporary feel. Also consider neutral colors, including gray, charcoal, ivory, or shades of white. You can pair up modern café curtains with the top kitchen cabinetry styles this 2019. But you can also use these short curtains to cover your smaller bathroom windows. They can even work as a second layer for added privacy in bedrooms. Stained glass isn’t only for churches and historic homes. Today, you’ll find these colorful and artsy glass windows in modern homes. They add a pop of color to an otherwise plain glass, making them bolder and visually-appealing. They make for ideal window treatments in kitchens, bathrooms, living rooms, and bedrooms. Depending on the colors used, stained glass can be semi-opaque, giving you more privacy. That means you don’t have to cover them up, so you can still enjoy the beauty of the artfully-designed glass. Aside from windows, stained glass also works great for decorative front doors. You can even use these to make your wall dividers prettier and more welcoming! Many businesses use frosted glass windows to achieve more privacy in offices. But these sandblasted or acid-etched sheets of glass are as great for home windows too. Not only do they increase privacy; they also help diffuse light without making it too dark. That makes them ideal for bathroom and bedroom windows. Unless you have giant picture windows, then you can also use frosted glass in the living room windows. Plantation shutters can be as contemporary as traditional, but that depends on materials. Hardwood shutters, especially in neutral finishes, are stunning contemporary window treatment ideas. Black, gray, brown, or bronze shutters against lighter-colored walls are a great match. Plantation shutters are also highly-functional, offering both improved privacy and UV protection. Even if you invest in the most durable furniture, they can still weaken and fade under the sun’s harsh rays. With UV-protective shutters, you can make your flooring, carpeting, and furnishing last longer. Top-quality shutters themselves make use of UV-resistant materials or finishes. That allows them to withstand the sun’s UV rays, even when installed on your home’s exterior. Like cafe style curtains, cafe style shutters are partial window coverings. The main difference is that shutters use harder materials, like wood or metal, and not fabrics. While cafe shutters are only for indoor use, they still allow for greater privacy. They don’t block out sunlight, so you can still enjoy natural illumination. Plus, these shutters come in the louvered style, so you can adjust them depending on how much light you need. It’s easy to match these shutters with a modern theme since they’re available in many finishes. Again, go for neutrals against white walls or white shutters against darker-colored walls. You can also use café curtains on the other half of the window for more privacy. Roman shades, when closed, hang down flat and cover the entire window. If you want to let more light in, you only have to pull the cord or lifting attachment. This will raise the fabric into horizontal pleats or folds. Modern Roman shades come in solid colors and various woven and non-woven fabrics. From deep blues to beiges to grays, you’ll find the perfect color to match your modern home theme. They’re also available in different fold or pleat sizes, and you can even have them customized. Roller shades, like Roman shades, also offer partial to complete light blocking features. But instead of pleats, the shading material gathers into a neat roll. These shades help protect your family and furnishings from dangerous UV exposure. For complete privacy, you can lower the fabric down to cover the entire window. When you want some sunlight, you only have to pull the cord attachment up to the height you prefer. You can also completely raise the fabric to let as much light in as you want. So long as you choose the right design and color, these shades make for stunning modern window covers. Solar roller shades feature fabrics designed to lessen glare and heat gains/losses. They also work much better in keeping harmful UV rays from passing through your windows. Because these shades reduce glare, they help reduce eyestrain caused by screen-time. Glare from TVs or computer screens can cause eye discomfort and even affect your vision. Especially since on average, we spend 10 hours a day in front of the screen. A reduction in heat gains or losses from your windows also helps conserve energy. It does so by putting less stress on your HVAC system, which then leads to more efficient performance. It’ll also take less time for your heater or air conditioner to heat or cool the room. Since solar shades are roller shades, they also offer privacy when closed completely. If you want to enjoy the view outside, you can completely or partly open them. Louver is a type of construction characterized by a parallel, horizontal material arrangement. Materials can be blades or slats of glass, wood, or metal. The slats or blades are either fixed or adjustable. The primary goal of a louver is to improve ventilation and control light penetration. They allow air to flow in and out, helping maintain optimal humidity levels indoors. Movable louvers let you control the amount of sunlight that penetrates your home. Modern louvered windows can even act as a weatherproofing element for your home. During the rainy season, they keep water out while still allowing for proper airflow. During summer, their angled slats still admit light while reducing direct sunlight. 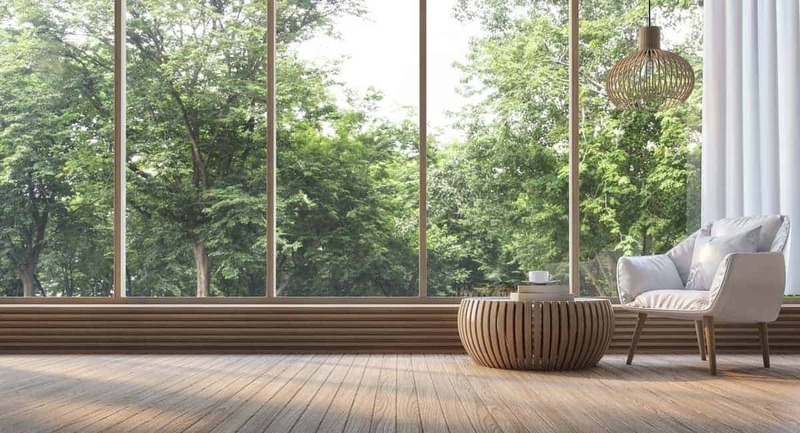 Today’s louvered windows are available in various materials, including glass, wood, and metal. You can also get them in different colors and finishes. With many options, you won’t have a problem matching them with your modern home design. The global window film market has grown to a whopping $721 million-industry in 2017. That’s because their use has expanded to include residential and commercial buildings. The potential energy savings they bring is the main reason behind their popularity. That said, you should also consider getting modern window films for your home. You can even pair them up with other window treatments to achieve greater light control. You don’t have to stick to plain darkening tints though, as you can get them in a multitude of designs. From floral to geometrically-shaped designs, there’s a lot to choose from. You’ll even find window films made to look like stained glass. Plus, these are easier to update if you get tired of the designs. They’re easier to remove as needed, compared with the other window treatments listed here. Follow the manufacturer’s instructions for removal though, to prevent glass damage. Modern window treatments allow you to improve your home at an affordable price. And with so many options to choose from, you’ll find the right ones to match your contemporary home design. So, as early as now, plan your window improvement project. The sooner you get these installed, the sooner you’ll enjoy lower electricity bills! While you’re at it, be sure to check out these other stylish home improvement project ideas. These’ll help raise your home’s comfort and livability, while also boosting its value.